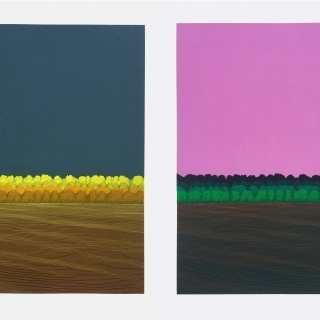 New York, NY (CHELSEA) Garvey Simon Art Access is pleased to announce a solo presentation in Gallery B of recent prints by New York artist and master printer, Ann Aspinwall. The exhibition will run from December 17 – January 3, 2015. A post-holiday coffee reception will be held on Saturday, December 27, 12-2pm. The artist will be present. Two recent suites of prints are featured in this intimate show. Aspinwall’s newest screenprints: Fortuny I, II, III, celebrate the colors and materials of painter, inventor, photographer, and fashion designer, Mariano Fortuny (1871–1949). The method of drawing was similar to that of the Tessuto Veneziano series, but here the line work is much larger and looser, suggestive of pleats and undulations. The lines often cluster together nearly in knots, or spread apart allowing the space between to come to the surface. Ann Aspinwall (b. 1976 in New York) received her MA in Art History from the University of St Andrews in Scotland in 1998. She studied printmaking at studios in Scotland and Italy. She previously worked as a printer at Pace Editions in New York and as a Print Specialist at the New York Public Library. In 2012 Aspinwall and Knut Willich founded Aspinwall Editions, a fine art print publisher and print studio with facilities in New York and Rheine, Germany. Her work is in the permanent collections of the Museum of Fine Arts, Boston, the New York Public Library, and the Smith College Museum of Art. She lives and works in New York. Garvey|Simon Art Access is located at 547 West 27th Street, Suite 207, between 10th and 11th Avenues. Gallery hours are Wednesday – Saturday 12-6. Thursdays OPEN LATE,12-8pm, and also by appointment. We will be closed Thursday, December 25 for Christmas and Thursday, January 1 for New Year’s Day. For further information, contact Liz Garvey at 917-796-2146 or liz@garveysimon.com.